What country comes to mind regarding major gluten ingestion? Italy of course. 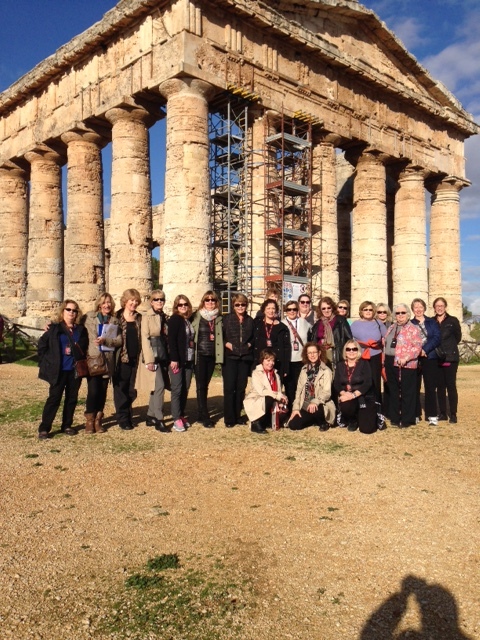 Our group of 21 just returned from a thrilling trip around Sicily. Sicily touring in December is off season but our temperatures were mainly 55-70 during the day and only one day of intermittent rain. There were no other tourists which you can see from this photo of the Greco-Roman temple at Segresta, Sicily. Several of the women, including our guide, Virginia, were gluten intolerant. Restaurants were used to preparing gluten free foods which included pasta made with rice and corn. The corn pasta was heartier and generally preferred. Supermarkets which we ‘haunted’, had entire sections devoted to gluten free products. So if you are on a special diet, the rest of the world seems to be also. Don’t worry about traveling with a tender digestive system; just notify us up front and we will order you special meals. (Pizza was the exception to the non gluten dishes). A travel tip from The Women’s Travel Group. Join another trip to Italy in May! Or grab a last place to South Africa this February Anyone forBali and SE Asia in March?